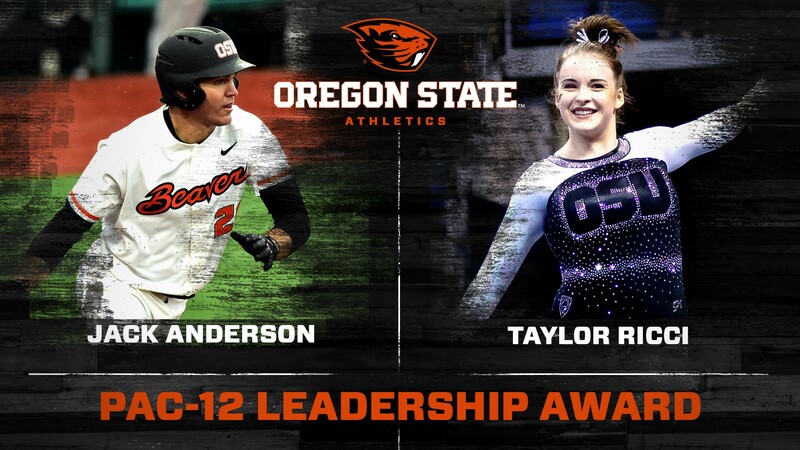 Oregon State baseball’s Jack Anderson and gymnastics’ Taylor Ricci – both Kinesiology majors in the College of Public Health and Human Sciences – are the recipients of the 2016-17 Pac-12 Conference’s Leadership Awards. It is just the second time since the Leadership Award was instituted during the 2001-02 academic year that a school has swept the honors. Arizona’s Darrell Brooks and Anna Chappell were recognized in 2005-06. The Pac-12 Conference established the Pac-12 Leadership Award in 2002 to recognize student-athletes who have served on their institutional Student-Athlete Advisory Committees (SAAC) and demonstrated leadership. This Pac-12 Leadership Award is a $3000 scholarship for postgraduate study awarded to one male and one female student-athlete each year. The Pac-12 Conference Student-Athlete Advisory Committee, which is composed of representatives from each member institution, selects the winners of the award each year from nominations submitted by each campus SAAC. To be eligible for the award, nominees must have completed their athletics eligibility, be enrolled in or plan to attend graduate school, have been a letterwinner in a varsity sport, and have served a minimum of one year on the campus SAAC. Other factors which may be taken into account during the selection process include other leadership activities, community service, grade point average, service as a SAAC officer, and level of athletic achievement. Jack, a three-year letterwinner and starter for the 2017 NCAA College World Series-bound Beavers, has been active in the classroom and the community since coming to Corvallis. A native of Lake Oswego, Ore., he is the SAAC Vice President and a member of the Pac-12 Student-Athlete Leadership Team (SALT), a group that is a part of the Conference’s governance structure whose mission is to advance the student-athlete voice and make important recommendations to the Conference’s athletic directors, senior woman administrators and faculty athletic representatives. He is also the community service liaison for the Oregon State baseball team and has successfully organized multiple opportunities for the team, including work at local schools – doing groundskeeping and maintenance work, for instance – and volunteering at local animal shelters. He also created a highly successful sports equipment drive for Beavers Without Borders. Jack is a two-time Pac-12 First-Team All-Academic selection, was recognized at the 2017 College World Series for having the highest grade point average on the team and was an Oregon State “Everyday Champion.” A kinesiology major with a minor in business entrepreneurship, he aspires to go to graduate school after he receives his degree. Taylor Ricci was a steady contributor for the Oregon State gymnastics program from 2014-17 before exhausting her eligibility last spring. An outstanding leader on and off the competition floor for the Beavers, Taylor served on SAAC for four years and served as president during the 2016-17 school year and was chosen as the Pac-12 Conference SAAC chairperson. She has been involved in a variety of community service projects including Habitat for Humanity, Relay for Life, OSU’s SAAC Holiday Toy Drive, a team visit to a local Veteran’s Home and has participated in three Beavers Without Borders trips. A native of North Vancouver, B.C., Canada, she remains the conference’s SAAC representative to the NCAA. Taylor, who studies exercise and sport science with an option in pre-therapy and allied health, is a three-time Pac-12 All-Academic First Team selection and a four-time scholastic All-American. Taylor joins volleyball’s Nikki Neuberger (2003-04) and gymnastics’ D’Anna Piro (2008-09), Leslie Mak (2011-12) and Stephanie McGregor (2012-13) as female student-athletes to be recognized for the Leadership Award. Jack, meanwhile, is the first male student-athlete to earn the honor at Oregon State.